Double the Spots, take a double look at this one. 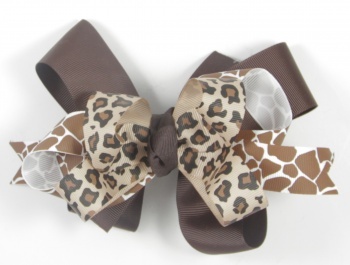 Yes that is giraffe prints mixed with cheetah prints all on one fabulous chocolate brown bow. This is all the prints rolled in to one! The bottom grosgrain bow is a 1.5" wide, layered with a 7/8" giraffe print grosgrain bow. The top is a tan with brown and black cheetah spots that is 7/8" wide. All wrapped by a brown grosgrain ribbon into a French knot and attached to a French clip.